PVD Coatings for Medical Devices Modern Machine Shop 65 | Surface Solutions | 763-785-9436 | tincoat.net What surface finishes lead to the best results? PVD coatings are very thin (typically ranging from 0.0001 to 0.0005 inch) and usually repli- cate a part's original finish (unless an abra- sive cleaning process is used). Best results are attained when part surfaces are smooth. As a result, ground or polished surfaces will often yield better results than bead-blasted or matte surface finishes. If a matte finish on a specific area of a part is desired, it might be best to allow the coater to produce the texture on the part. Texturing by the part supplier could produce contamination on that area of the part, which would require some rework, negating any savings the supplier was perhaps counting on attaining. What temperatures are used in the coating process? Typical coating temperature for all Surface Solutions PVD coatings is approximately 800°F. Coating temperature can alter the hard- ness of parts or cause them to distort (shrink or grow). To minimize this possible effect, we suggest that heat-sensitive parts be tempered at 900 to 950°F before they are sent to be coated. What types of materials can be coated? PVD coatings can be applied to most metals that can withstand being heated to 800°F. Commonly coated medical materials include 303, 440C and 17-4 stainless steels; titanium alloys; and some tool steels. PVD coatings are typically not applied to aluminum, because the temperature of the coating process is close to material's melting point. What coatings are typically used for medical devices? Surface Solutions offers four PVD coatings for medical devices. The most commonly used is tita- nium nitride (TiN), which has a thickness ranging from 0.0001 to 0.0002 inch, Vickers hardness ranging from 2,400 to 2,600 Hv, and a gold color. The second most common medical coating is .... ground or polished surfaces will often yield better results than bead- blasted or matte surface finishes. aluminum titanium nitride (AlTiN), often referred to as the black nitride or black titanium coating. It has a thickness ranging from 0.0001 to 0.0002 inch, hardness ranging from 4,000 to 4,200 Hv, and a charcoal-black finish. Two other medical coatings the company offers are chrome nitride (CrN) and Alpha. CrN has a thickness ranging from 0.0001 to 0.0005 inch, hardness ranging from 2,200 to 2,400 Hv, and a silver finish. Alpha is a multi-layer coating that has zirconium nitride (ZrN) as the top layer and results in a silver-gold color. It has thickness ranging from 0.0001 to 0.0002 inch and offers the highest hardness, ranging from 4,400 to 4,600 Hv. The company says this coating can last two to four times longer than TiN due to its higher hardness, lubricity and abrasion resistance. 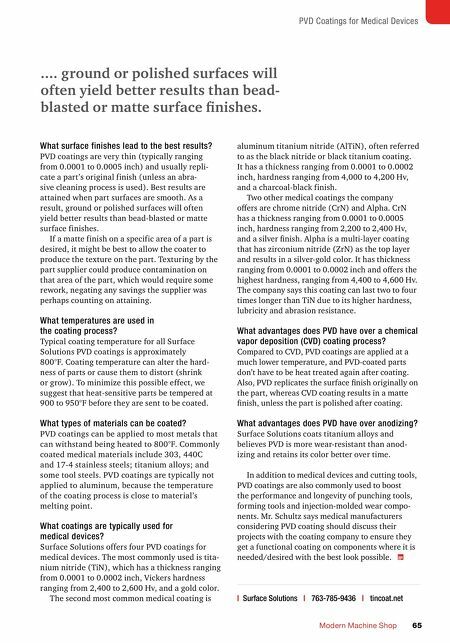 What advantages does PVD have over a chemical vapor deposition (CVD) coating process? 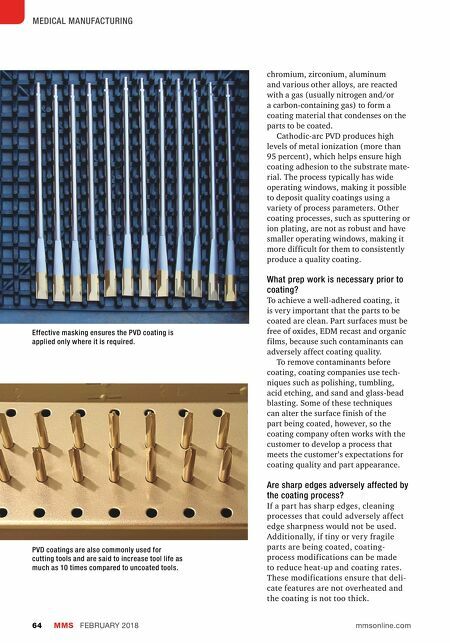 Compared to CVD, PVD coatings are applied at a much lower temperature, and PVD-coated parts don't have to be heat treated again after coating. Also, PVD replicates the surface finish originally on the part, whereas CVD coating results in a matte finish, unless the part is polished after coating. What advantages does PVD have over anodizing? Surface Solutions coats titanium alloys and believes PVD is more wear-resistant than anod- izing and retains its color better over time. In addition to medical devices and cutting tools, PVD coatings are also commonly used to boost the performance and longevity of punching tools, forming tools and injection-molded wear compo- nents. Mr. Schultz says medical manufacturers considering PVD coating should discuss their projects with the coating company to ensure they get a functional coating on components where it is needed/desired with the best look possible.